I was reading up on the skyscrapercity forum today and spotted some of my projects being posted up there. Pretty interesting forum - and very informative indeed. Anyways, I've decided to post up two photos... if you are familiar with Crest Builder's projects, perhaps you can try to guess where is my project, and which project it is. Scroll down further to get the answer. Can you spot where my Project is? *hint* picture taken from KL Tower. How about this one? Also taken from KL Tower. This picture was taken from KL Tower. On the bottom left is the Shangri-la Hotel; above is on the left would be where Jalan Sultan Ismail is. Travel further up the road, and you'll see a low hotel - thats Equatorial Hotel. My Project is right there behind it - Menara Wakaf, Jalan Perak. This is actually a much more simpler picture. 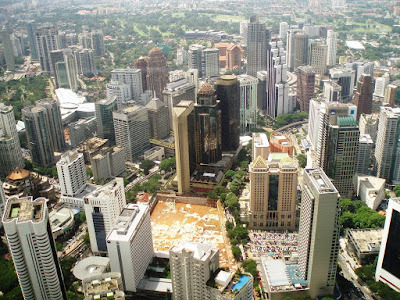 Also taken from KL Tower, this faces the Jalan Imbi direction. You can see Berjaya Time Square on the far back - and coming closer, I'm sure you can spot the AmBank logo - yes, thats Jalan Raja Chulan. 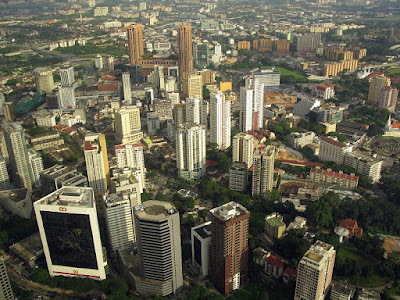 The project to be spotted here is on the centre right side of the picture - thats Verticas Residensi, Bukit Ceylon.